Prinz Eisenherz. Badischer Verlag Freiburg and Welt am Sonnabend. Germany. Badischer Illusstrierte, Illustrierte Woche (1950-1956), Welt am Sonnabend, Neue Welt am Sonnabend, Neue Welt (1957-1971) are all different names for the same publisher. They are the oldest publisher of Prinz Eisenherz in the German Language (before this our Prince was only printed in 1939 in the Magazine "Papagei", under the name of "Prinz Waldemar"). After this, first "Melzer", and secondly "Goldman Taschenbuch" did all reprint the old work of Bädische Verlag. The first series of books are all published between 1953 and 19563 in the newspaper with the names mentioned above. In total 12 books are printed (under the name of Bädische Verlag Freiburg). This is what I call serie 1. In the mean time, or starting just before that (between 1950-1968) Welt am Sonnabend publish 19 black and white book volumes. The first number (number 0) was an announcement number. This is what I will call serie 2. Not all volumes of this serie have titles. 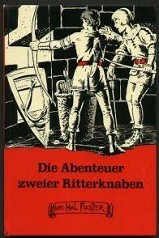 The "Abenteuer zweier Ritterknaben" (The Medieval Castle) was published in a seperate and now very rare book. It's a small HC book, 128 pages black & white, printed in 1958 and made like a Max Trell book (story with pictures). 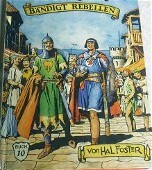 1: In den Tagen König Arthurs (1953). 2: Kämpft gegen die Hunnen, (1954). 8: Der Spion des Königs. 10: Als treuer Freund (1959). 11: Als Retter der Verfemten. 12: Sein gefährlichstes Abenteuer (1961).